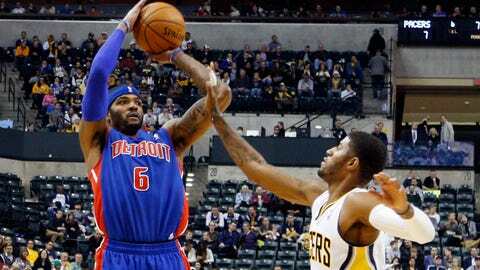 Indianapolis, IN, USA; Detroit Pistons forward Josh Smith (6) takes a shot against Indiana Pacers forward Paul George (24) at Bankers Life Fieldhouse. Remember when the Cavs vs. Pistons really meant something? Well, guess what? It does again. Both teams believe they improved their rosters over the season, both hired new coaches and added some big names. Right now, it hasn’t resulted in a whole lot — but both teams do look slightly improved. They also both figure to fight for a playoff spot all season. Players and coaches often tell you either: A). There’s no such thing as a statement game; or B). It’s much too early for one. Guys like me will tell you that’s not true. This is statement game. — The Cavs didn’t practice Sunday, nor did they provide an update on the status of SG Dion Waiters (wrist). He again is likely to be a game-time decision. Rookie F Anthony Bennett (sick) is also listed as TBD. Both Waiters and Bennett have missed the previous two games. The Pistons have no injuries to report. — This is the Cavs’ third game against a Central Division opponent in four nights. The split the first two (beating Milwaukee, losing at Chicago). Meanwhile, the Pistons have lost two straight — both at home (vs. Charlotte and Houston). — The Cavs are shooting .917 from the free-throw line (33-of-36) over the last two games. — Cavs PF Anderson Varejao leads all NBA reserves in rebounds at 9.2 per game. He is just 10 boards away from replacing Jim Brewer (1,292) for third place in franchise history. — The Pistons are clearly one of the league’s most puzzling teams. They lost to Charlotte and New Orleans at home. But they also beat Indiana and Miami on the road. — Either way, the Pistons are 7-6 in December (compared to 5-10 in November), increasing their scoring average to 102.8 ppg this month (compared to 97.3 last). — The Pistons are first in the NBA in points in the paint (51.9). — The Cavs have lost six straight to the Pistons, including all four meetings last year. This is their first matchup of the season.